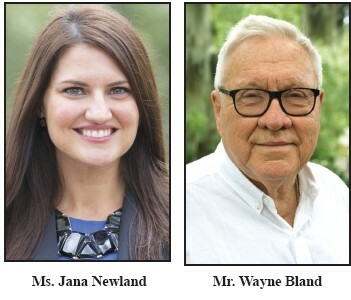 Senior Citizens, Inc. (SCI), a nonprofit organization dedicated to helping people age successfully is pleased to announce the addition of Mr. Wayne Bland, the founder and former owner of Recovery Place and Ms. Jana Newland, Vice President and Branch Manager with South State Bank. A graduate of the University of Michigan and Georgia Southern, Mr. Bland has extensive experience in childhood development, mental and behavioral health, and addiction therapy. Actively involved in the community, Mr. Bland currently serves as the Chairman of the Church Council of Asbury Memorial Methodist Church and a board member for Recovery Place. University with a BBA in Finance began her banking career in Atlanta before moving to Savannah in 2007 with her husband and three children. An active community supporter, Ms. Newland has been a Junior League member and a fundraiser for Urban Hope. “We are fortunate to have such an outstanding people willing to lend their insight and experience to our organization,” said Patti Lyons, president at SCI.